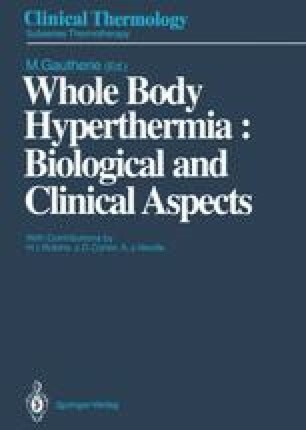 Preclinical in vitro and in vivo studies suggest that hyperthermia enhances the sensitivity of tumor cells to ionizing irradiation at temperatures consistent with ~42°C WBH (Belli and Bointi 1963; Ben-Hur and Elkind 1974; Ben-Hur et al. 1972, 1974; Cater et al. 1964; Gerweck et al. 1975; Henle and Leeper 1976; Kim, JH et al. 1974; Overgaard and Overgaard 1972; Robinson and Wizenberg 1974). Conceptually this phenomenon could result from the cumulative effects of at least four distinct processes.